~*~ Juz Mel: Part & Parcels of Life ~*~: Events the last few weeks: AO 2011, Troy's Birthday and CNY Reunion Dinner. Events the last few weeks: AO 2011, Troy's Birthday and CNY Reunion Dinner. 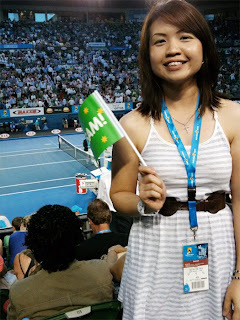 And if you're interested there's more photos from my Australian Open: Thu 20 Jan 2011 album on facebook. And that was pretty much our last few weeks! In the mean time, Saturday tennis has resumed and so will Kings Park social comps next week! Just can't wait to get right back into 3-days of tennis per week. I've been a little off touch lately and having to deal with some emotions as well. But let's hope things improve from there!